Someone emailed me on what it took to actually put the maze together. This section is a cut and paste of my email response. 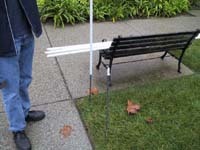 This maze is made of 1/2" PVC pipe and connectors. The cross connectors are the best/most useful but the most expensive. Don't waste your money buying elbows. Tee's do the exact same thing and are more versatile. There's usually two kinds of PVCs; sch40 and another kind. One is stiffer and costs about 20-40 Cents more. If you are doing a lot of close hallways you don't need to worry about getting the stiffer pvc. All the frames will hold itself together. You'll need to figure out how big the setup needs to be. Our maze hallways were 3' wide and we made a bigger room for the poka-dot-room. We had to run to home depot a few times. The structure was 8 feet tall. 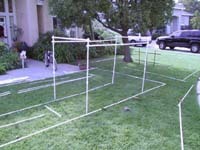 We put our maze on grass and used rebar to put into the ground then slid the pvc over it. If you're not doing this on grass you're on your own on how to get it to stay up. The walls are made of black painter's sheeting. About 40 bucks for 2000 sq feet. 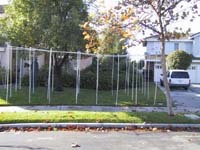 The roll is usually 10' high and about 200' long. Though, that's dependant on the mil (thickness). You want to go with a higher mil (about 6). The thin stuff is just too thin. Below are some examples of how stuff connects. Here's a basic connection using Crosses. There are the 2" pieces that connect the crosses on top of one another. You can see in the lower section there's a bunch of two footers that are connected wtih couplers. Couplers are cheap and your friend. Don't be afraid have a bunhc of smaller pieces. The lattice work is together. Once you get a lot of pieces together the structure becomes more solid.